(Bloomberg) -- A dearth of investment in Libya’s oil sector, as well as heavy borrowing by the state from local banks, is sharply undercutting the OPEC member’s ability to revive production critical to the economy, the United Nations envoy to the country said. 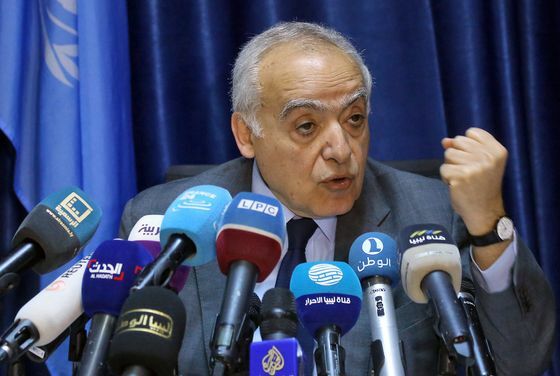 The warning by Ghassan Salame hangs over tortuous efforts by the North African nation’s two rival leaders to reach a power-sharing agreement that could mark a breakthrough in ending a ruinous eight-year war that began with the ouster of Moammar Qaddafi. Libya needs to “reinvest quickly in oil fields because some of the oil fields are being depleted,” Salame said in an interview late Saturday. “With the new technology that is needed you can do marvels, and nothing is being done on this level.” State-run National Oil Corp. doesn’t have access to sufficient funding to do the job, he said. Salame has been spearheading the reconciliation push between the internationally-recognized government of Prime Minister Fayez al-Sarraj and eastern strongman Khalifa Haftar, who controls most of Libya’s oil resources after an offensive in southern provinces this year. Haftar’s victories alarmed overseas backers who feared he could attempt a disastrous march on the capital, and fueled renewed efforts for a peace deal. A UN-sponsored national conference will be held on April 14 to agree a roadmap for the country, including plans for long-deferred elections. Oil revenue accounts for almost all Libya’s hard currency and is the life-blood of the government. But infighting between dueling administrations in the west and east has interrupted oil shipments and production, hitting the economy and roiling global oil markets. The North African nation that sits atop the continent’s largest proven reserves of crude needs oil at $114.4 per barrel to break even, according to the International Monetary Fund. That puts it at the top of the list of Middle East and North African oil exporters. NOC head Mustafa Sanalla said that oil production is now in the range of 1.2 million barrels a day after its largest field, Sharara, resumed production. The field, with a capacity of around 300,000 barrels per day, had been shut down in December after guards and armed residents seized it over financial demands. It was restarted last month when Haftar’s Libyan National Army -- the country’s largest organized force -- swept south and secured control of the field. Salame said the country needed to scale back on public-wage spending. “Sixty percent of the budget is going to salaries, where you don’t see an effect on the state of productivity,” he said. At the same time, government borrowing from banks had reached 35 billion dinars, and was driving some lenders to the wall, especially in Haftar’s east, according to Salame. “This needs to be repaid if we want these banks to survive,” he said. A political settlement between the administrations that unified important institutions is critical to resolve economic challenges, Salame said. Oil revenues at current levels would suffice if better managed, he said.